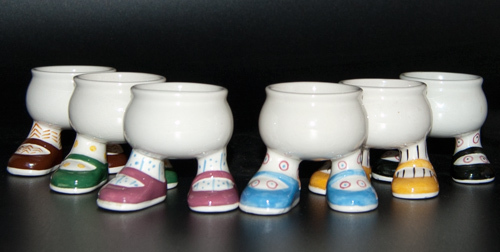 A set of six Carlton Ware Walking Ware egg cups designed by Roger Michell. Shoe colours are brown, green, pink, yellow, black and including the more difficult to find sky blue. Printed marks for Carlton Ware/Lustre Pottery on each eggcup.